These sleek control surfaces are scaled just right for producing news and voiceovers. Like the LX-24, the L-8/L-12 have all the latest goodies plus are hot swappable down to the individual fader. These cousins to the popular LX-24 are big in capability but scaled for news production, voiceover work and all those applications requiring a solid control surface that will deliver under deadline. The L-8 and L-12 are based on all the same design principles as the LX-24 – precision-built, low-profile, tabletop IP control surfaces with hot-swappable individual fader modules that offer assignable sources to any fader. Each fader can access four stereo output busses, a stereo cue bus, and its own individual Bus-Minus. An OLED source name display, an A/B source selector, and one programmable soft button are also provided, and a SET button gives access to assignable controls in the master section. Snapshots of the L-8 or L-12 configuration can be saved and recalled at the touch of a button, making setup for different working sessions a snap. The L-8/L-12 meter bridge features three sets of bright, high resolution LED meters. A digital timer is also included. The console has control room and headphone outputs with level controls and source selection, as well as an independent studio monitor output. The L-12 also has a built-in cue speaker. These are designed for use with the WheatNet-IP Intelligent Network. 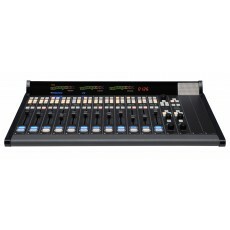 An IP88CBL Console Audio BLADE provides the audio mix functionality as well as power to the L-8 (the L-12 has a dedicated power supply); additional BLADEs can be added for inputs and outputs in a variety of digital and analog formats.These new IP consoles are sleek, versatile, and low profile (no tabletop cutout needed). Just plug the L-8 or L-12 into your WheatNet-IP Intelligent Network, and quickly assign any source of any type from anywhere in your network to any channel fader. For the L-8/L-12, we’ve moved the logic, audio and interface to a single space rack unit we call the IP88CB Console Audio BLADE. This mix engine and I/O unit handles all the interfacing and heavy lifting. It connects to the L-8/L-12 control surface via standard Ethernet. The two of them together make an incredibly powerful self-contained console. But there’s more – they enable you to become a part of the WheatNet-IP network (if you have one, of course). This means that with the L-8/L-12, you’ve got the first building block to a networked facility or you’ve got another station on your existing network. Either way, the functionality you get with the L-8/L-12 is pretty breathtaking. Any channel can be assigned to one or more of the four program output busses, making your material available to an on-air feed as well as an internet stream, for instance. Any input can be called up on any channel on the L-8/L-12. This means, for instance, the feed you’ve got plugged into input 7 on the back of the Console BLADE (or ANY BLADE I/O Interface) can show up on channel 2…or any other channel. Same with any input. Not only that, you can assign a backup or different source to the same channel and switch on the fly by using the SOURCE A/B buttons. As if this isn’t cool enough by itself, think about the flexibility if/when you decide to link the L-8/L-12 up to a network. Imagine having any source on the network at your fingertips, with no patching. We’ve built the L-8/L-12 (in New Bern, NC USA, by the way) to be easily accessed by you. No ‘one-surface, gotta take the whole thing apart construction’ here. If you need access to a channel, all it takes is two screws and you’re in. Makes it a breeze to service or simply swap out a module. Each fader has a dedicated Mix-Minus output that includes all active faders on its selected source bus, except for itself. These auto generated monaural Mix-Minus signals may be routed to feed telephone hybrids or other devices as required. Alternately, these outputs may be set to provide a separate direct output from that channel only, consisting of the source assigned to that channel. Each channel has a talkback that will interrupt the feed to that mix-minus. The IP88CBL provides powerful interface options, including four AES inputs, four stereo analogue inputs, four AES outputs, and four stereo analogue outputs on RJ45s; control room and studio stereo analogue outputs on XLRs, two mic level inputs with gain trim and switchable phantom power on XLRs; cue and headphone outputs on both RJ45 and 1/4" TRS, and 12 GPI logic ports on RJ45. There is an integral power supply DC out the for L-8. The L-12 utilizes an IP-88CB and a compact external power supply.